Only if you live under a rock can you possibly not know that sugar is bad for you! The crimes of sugar are numerous, but let’s start with some obvious ones: it rots our teeth, packs on the pounds, and provides zero nutrition. If that's not enough for you to toss that candy bar into the trash, how about this: sugar has also been linked to everything from diabetes and heart disease to skin problems, depression/anxiety, and even cancer! Sugar is one of the most pro-inflammatory foods out there – and that’s the reason it’s associated with so many chronic illnesses. Chronic inflammation is the basis of most diseases, so when we eat too much sugar, it can be detrimental to our overall health. You don’t suffer from heart disease, diabetes, or chronic illness? Wonderful, but! Reducing our intake of sugar regardless – and giving our bodies a sugar “detox” while we’re at it – does our bodies (and minds!) endless good, especially if we’re feeling tired, moody, stiff, and/or achy. Do you think you’re a sugar addict? You can break the sugar habit! 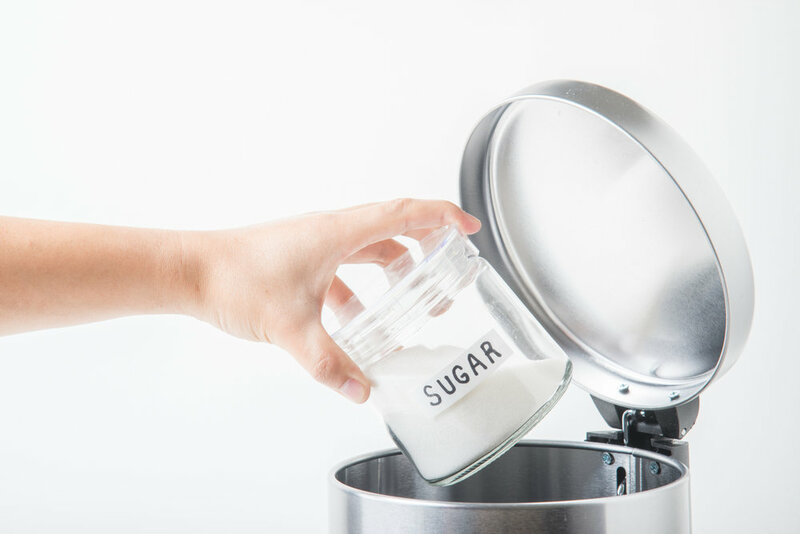 OK, it isn’t easy – studies show that sugar can have a stronger effect on our brains than cocaine and heroin – but that’s why I’m here: I’ve come up with some helpful tips for dealing with sugar addiction! They’re naturally sweet and healthy – and best of all, they’re delicious. The more naturally sweet veggies and fruit we eat, the less we crave sugar. Replace Sugar with Healthy Fats! Eating healthy fats, such as avocado, nuts/nut butter, hemp seeds, eggs, and hummus can really fill us up, keep up satiated, and we will be less likely to crave sweets. Very often our sweet cravings are a sign of dehydration. Before reaching for the Ben & Jerry’s, have a glass of water. Now just wait a few minutes and see what happens. I guarantee that sugar craving disappears. Say No to Artificial Sweeteners and Sugar Substitutes! Why? Because they’ve been linked to increased sugar cravings and weight gain! If you need a sweetener, go for sugar in its most natural form: pure maple syrup, coconut nectar, raw honey. Just make sure you are consuming minimal amounts! Next time a craving for sweets sneaks up on you, grab a turn on Words With Friends, send out a tweet, or just go outside for a short walk. Most cravings only last a few minutes, so by the time you’re done distracting yourself, hopefully that craving will have gone bye-bye! Go to sleep! When we’re constantly stressed and/or sleep deprived, our bodies crave the quickest form of energy out there and unfortunately we know what that is: sugar!! Avoid anything that contains added sugar, which turns out to be most fat-free and low-fat packaged goods. Look for products that contain no more than 15 grams of sugar per serving. Experiment with spices! Cinnamon, nutmeg, cloves, and cardamom are just a few of the spices we can use to naturally sweeten our foods and reduce cravings! Ready to get that sugar monkey off your back? Just a warning: when we start reducing our sugar intake, our bodies initially don’t like it and you may feel, well… awful at first (depending on how much sugar you are used to consuming!). Don’t let that stop you! This yucky feeling shouldn’t last more than two or three days and then… you will feel GREAT!! When sugar is the driving force behind our fatigue and mood swings – and so much else that plagues our systems – detoxing from or reducing sugar has us feeling fab right away. Older PostBaby, It's Cold Outside!